Federal law enforcement agencies are making more arrests for immigration-related offenses and fewer arrests for other types of offenses – including drug, property and gun crimes – than they were a decade ago, according to a Pew Research Center analysis of new data from the Bureau of Justice Statistics. Half (50%) of the 165,265 total arrests made by the federal government in fiscal 2014 – the most recent year for which statistics are available – were for immigration-related offenses, such as crossing the border illegally or smuggling others into the United States. 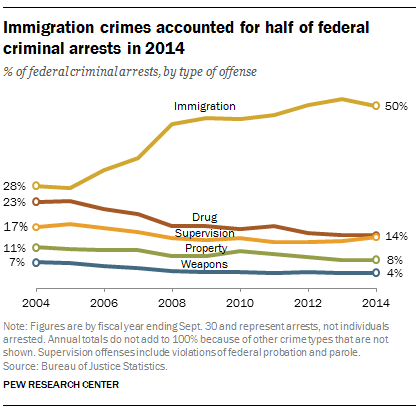 A decade earlier, immigration-related offenses accounted for 28% of all federal arrests. 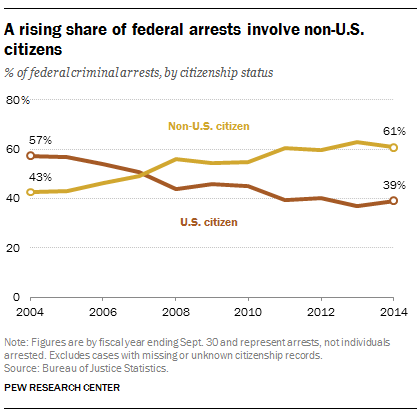 At the same time, arrests for drug crimes fell from 23% of the total in 2004 to 14% in 2014. Those for supervision violations, such as probation or parole infractions, fell from 17% to 14%. Arrests for property crimes, including fraud and embezzlement, declined from 11% to 8%. And arrests for weapon offenses, such as possession of an unregistered firearm, fell from 7% to 4%. The figures, released by the bureau in March, count all arrests made by the federal government, ranging from traditional law enforcement entities, such as the Department of Justice (DOJ) and the Department of Homeland Security (DHS), to less traditional ones, such as the Interior and Treasury departments. They do not include arrests made by state and local authorities, which make the vast majority of U.S. arrests each year (nearly 99% in 2014). While the 2014 data do not necessarily reflect current trends, they highlight a growing focus on immigration offenses on the part of federal law enforcement agencies. One striking reflection of that shift is the emergence of DHS as the federal government’s leading arrester, surpassing DOJ in 2007. In 2014, DHS made 59% of all federal arrests, up from 37% in 2004 (the earliest year for which data are available following the department’s establishment in 2002). 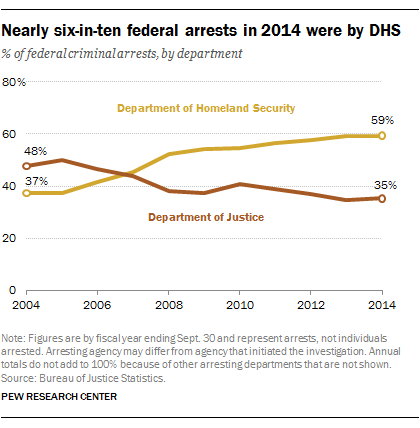 By comparison, DOJ made 35% of all federal arrests in 2014, down from 48% a decade earlier. In fact, just one agency within DHS – Customs and Border Protection – made more arrests in 2014 (64,954) than all of the agencies within DOJ combined (58,265). DOJ agencies include the FBI, the Drug Enforcement Agency, the Bureau of Alcohol, Tobacco, Firearms and Explosives and the U.S. Marshals Service. The growth in arrests by Customs and Border Protection coincides with a significant staffing increase within the agency, particularly during the mid-to-late 2000s. Between 2004 and 2010, the number of Border Patrol officers almost doubled, rising from 10,819 to 20,558. The federal government’s increasing focus on immigration offenses is evident in other aspects of the Bureau of Justice Statistics data. The geographic distribution of federal arrests also shows the growing emphasis on immigration offenses. In 2014, 61% of all federal arrests – or more than 100,000 – occurred in just five federal judicial districts along the U.S.-Mexico border. In 2004, those five districts – one each in Arizona, California and New Mexico, plus two in Texas – accounted for 40% of federal arrests. The annual totals used in this analysis are by federal fiscal year, which ends on Sept. 30 of the year cited. The data refer to the number of arrests made by the federal government, not to the number of people arrested, since individuals may be arrested more than once. (About 156,000 people were arrested for federal crimes in fiscal 2014; there were about 165,000 total federal arrests that year.) The data also don’t reflect the number of people who are ultimately prosecuted or convicted, since not all arrests result in prosecution or conviction. In addition, arrest figures for immigration offenses are not the same as migrant apprehensions or deportations. Apprehensions refer to cases in which foreign nationals are caught in the U.S. without authorization and can include civil as well as criminal violations. Arrests refer to cases in which individuals are booked for criminal violations of federal immigration laws, according to the Bureau of Justice Statistics. (The number of apprehensions each year is far higher than the number of federal arrests for immigration offenses.) Deportations, meanwhile, refer to cases in which unauthorized immigrants are removed from the country.